It’s hard to believe that Fight for Life has now been fundraising for almost twenty years! Since we first began our work in 1996, we have raised sufficient funds to provide a wide range of new equipment for the radiotherapy department at University College Hospital, which together with Great Ormond Street Hospital forms Britain’s largest children’s cancer centre. During this time we have achieved so much, including provision of a state-of-the-art linear accelerator – the high energy radiotherapy equipment used for treating childrens’ cancers – and also a really well-equipped and friendly playroom area as well. This was achieved by tremendous hard work and the wonderful support of so many people both within the organisation and far beyond. Other projects have included several “First-in-UK” technical advances, allowing ever greater accuracy in treatment of deep-seated tumours both in children and adolescent patients, a particularly challenging group. All this has meant that the young patients under our care have been treated to the very highest standards, and we can now claim in all honesty to be a world class paediatric cancer treatment centre – second to none. As far as I am aware, there is no other similar facility anywhere in the UK, with such a wide range of expertise and modern equipment. We work very closely with Great Ormond Street Hospital, with several jointly appointed consultants. This has been a long- standing relationship going back several decades, and Great Ormond Street has no radiotherapy facilities of its own. For the past ten years we have been working in a wonderfully equipped new radiotherapy department at UCH, which has repeatedly been voted as Britain’s top NHS hospital. For research into childhood cancers we will also work closely with our colleagues at Great Ormond Street and University College London-which I am pleased to report has also been voted Britain’s top academic institution! Our recent projects have included the installation of the UK’s first state – of- the- art Truebeam unit, a high energy, highly versatile and extremely precise new radiotherapy machine. We have purchased this in a unique collaboration between Fight for Life and our colleagues at HCA International (“Harley Street at UCH”) and virtually every child who needs radiotherapy at UCH is now treated using this fantastic equipment. I am pleased to tell all our supporters that we have almost paid off the whole of the loan we initially raised, in order to have access to this terrific treatment machine, even before it was fully paid for. As, ever a huge “thank you” from all the medical and professional staff here at the Department of Radiotherapy at UCH. Without Fight for Life’s wonderful and sustained support, we would not have been able to maintain our proud position at the pinnacle of the Premier League. Prof Jeffrey S Tobias MD FRCP, Consultant in Radiotherapy & Oncology & Professor of Cancer Medicine. Medical Director of Fight For Life. 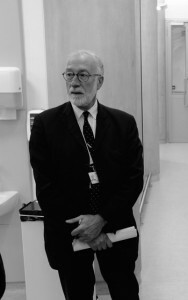 Consultant oncologist since 1981 and Professor of cancer medicine at UCL since 2001. For the past ten years, a member of the council board of Cancer Research UK. Past president of the British Association for Head and Neck Oncology. Chair of the CRUK breast cancer ‘think tank’ for ten years from 1990, and Principal Investigator of several large international trials of breast cancer therapy. Several books on cancer including two for the general public. Many peer reviewed original papers and books on research and medical ethics.